The Scottish Government has recently revealed ambitious plans committing to new climate change and energy efficiency measures, a recent news report has been able to suggest. The government has revealed plans to invest more than half a billion pounds in energy efficiency in a bid to combat fuel poverty in the next four years. This year it will provide £10 million to fund projects which deliver the “greatest reduction in carbon emissions and support Scotland’s most deprived communities”. It will also launch an Energy Efficiency Programme in 2018 with accompanying regulation to improve the efficiency of the building stock over the long term, helping reduce costs and tackle fuel poverty. The valve’s controlling software, simple and eas, enable users to set specific functioning times for each valve. 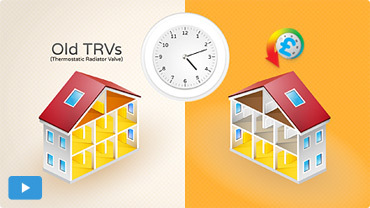 Since radiators are individually controlled, the HeatSave valves enable users to maximise the zoning potential and reduce energy consumption in those areas that are not used for longer periods of time (as for example, dining or sitting rooms and kitchens during the night, etc. ).